Are you learning Spanish with your child? Have you studied Spanish, but would appreciate a chance to review? Rocket Spanish Premium is an online course from Rocket Languages and it loaded with material and resources to help you learn Spanish. Rocket Spanish Premium is an interactive online course for adults. It is divided into ten units, each with several lessons and many components. Each lesson has audio with instructions and Spanish language dialogs, vocabulary, cultural information and quizzes. There are also lots of extra lessons, games, readings and quizzes. The audio can be downloaded and the dialogs can be printed, so this online course can be used in other settings too. In addition to the dialogs, culture and grammar, vocabulary, and quizzes for each lesson, there is a huge amount of supplemental material. Each lesson has extra vocabulary, and there are also reading comprehension passages with vocabulary, bonus lessons with audio to practice the vocabulary, games, and extra quizzes to review material from the units. Simply put, there are lots of ways to learn and practice Spanish incorporated into the structure of this course. It is a wonderful resource and fortunately it is a lifetime subscription – there is plenty to keep you busy and learning for a long time to come. All of the audio is exceptionally clear and well paced. When new material is introduced, it is presented slowly, while the audio on the review quizzes is faster. The Spanish in the lessons is presented in manageable quantities, and broken down for pronunciation and meaning. This gives students a chance to process what is being presented and really master the material. There is a lot of teaching that is included in the full audio of each lesson. These pronunciation tips and information on vocabulary and grammar are great! Of course, you can choose to listen to just the dialog once you are familiar with the explanations, but I love that this information is easily accessible and presented in an engaging, concise way. There is a very easy-to-use feature to make and save your own vocabulary list from the words in the dialogs. In addition, you can make and save notes about each lesson. Both these features encourage students to take an active role in the learning process. In the Motivation Center, you will find information about how to learn a language and strategies to be successful. I believe this is one of the most valuable components of this course. The experts at Rocket Languages have distilled the complex process of language learning into key points and present them here in a clear and engaging way. The advice on learning styles, pronunciation, vocabulary acquisition and many other topics is based on years of experience and research. They explain how to apply the strategies to the course materials and to your daily life. As a teacher, this is exactly the information I try to communicate to students again and again. If you apply these strategies, you will learn Spanish. Rocket Language users are great! I had a really good time reading the discussion forums. These learners are all actively working at the language. Their sincere enthusiasm about learning Spanish comes through as they share experiences and help each other. One thing to be aware of, Rocket Spanish is essentially a translation-based course. In other words, the meaning of the Spanish words is established by relating them to English, rather than through pictures or images. The cards and games in the MegaSpanish Bonus lessons have pictures, but in general, meaning is established by translation. This is arguably one of the most efficient ways for adults to learn language. However, if you are a very visual learner you might benefit from finding video that lets you see and hear the same vocabulary used in a visual context. 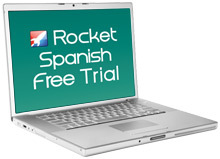 Rocket Languages’ Rocket Spanish Premium has lots of information and opportunity packed into one source. This is a wonderful opportunity to win a lifetime subscription to this course! I am a student, and I think this looks like a very interesting product! Thanks for the give-away! I am a parent and a teacher. Gracias! I am a parent, teaching my son Spanish vocab and simple sentences (he’s almost 3). I would LOVE to have this so I can teach him what I learn! I am a parent, and I greatly appreciate your blog. Count me in for this give-away! I am a parent and French teacher. I’m learning Spanish! Yo soy una madre de un nino de 3 anos que habla solo en Ingles por el momento y soy una terapista del habla/lenguaje trabajando en Ingles con ninos que sufren de incapacidades del habla/lenguaje. Me gustaria encontrar un programa bueno para ensenarle a mi hijo hablar en Espanol y tambien para posiblemente ensenar a otros ninos durante mis veranos libres como un trabajo adicional. I am a Spanish teacher for children 3 years+ right through to adults. I religiously check this blog for great ideas and other websites – you’ve done so well! Sign me up! I’m a student and I need this! I’m a teacher. I teach second grade.